Need a discount for Trust.Zone VPN? It's easy. 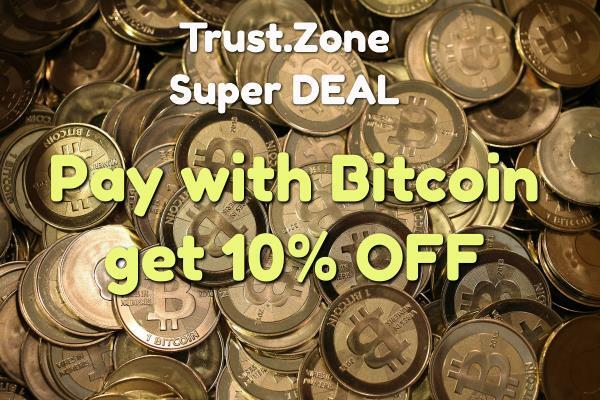 Just choose Bitcoin as payment method and get 10% OFF. Why Bitcoin? Bitcoin is the most anonymous and safe payment method. No personal details needed! Lastname, firstname, credit card details are NOT NEEDED! The limited time offer. You can try unlimited features of Trust.Zone VPN totally for free. Trust.Zone VPN provides users with 3 days VPN usage for FREE. Paid subscription starts from $3.33/mo only. If you pay via Bitcoin - it's just $.2.99/mo. With a paid VPN subscription, you are able to connect to VPN from 3 devices at same the time..